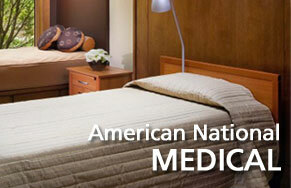 Bring the comfort of a high quality hotel mattress right to your own bedroom. 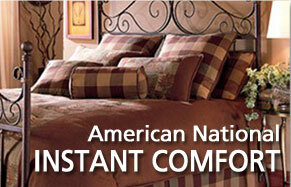 The Foam-Encased Plush Top Mattresses from the Sterling Cameo collection offer great value without sacrificing quality. Fabric is manufactured with a natural antibacterial Aloe Vera treatment, providing the ultimate soft and hygienic plush top mattress. 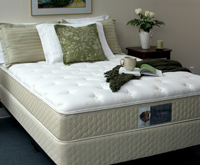 Each mattress manufactured by Sterling Sleep is unique as it is sure to provide comfort, warmth and the softest fabric allowing the most comfortable night’s sleep. 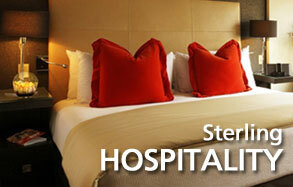 Sterling Sleep uses the highest-quality, materials to manufacture their Verticoil Foam-Encased Plush Top mattresses. With a strong commitment to honor the earth, the Cameo Innerspring Sleep System is assembled using replaceable parts that can be switched out when worn or soiled. 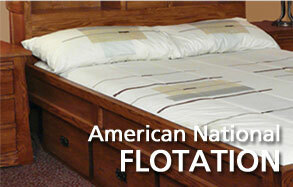 Feel confident about your plush top mattress purchase knowing you’re contributing less waste for the environment. 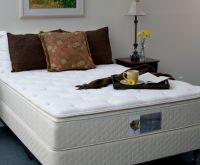 The luxurious firm support of fully foam encased VertiCoil tempered springs, real foam edge support and a removable Stretch Knit tack and jump style Pillow Top. 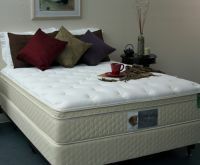 Luxurious high profile Euro Top with choice of 2” plush memory foam or 2” firm latex for each side, foam encased VertiCoil springs, foam edge support and removable Stretch Knit Euro Top.